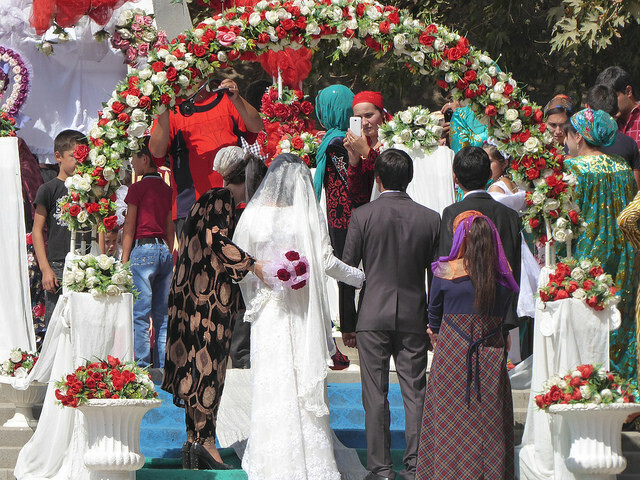 Photo: Wedding in Tajikistan by Hans Birger Nilsen/ CC BY. This update covers developments affecting civic space in Tajikistan from August to October 2017. It has been prepared for the Civicus Monitor by International Partnership for Human Rights (IPHR) and its partners from Tajikistan, Nota Bene and the Lawyers’ Association of Pamir. As previously reported, a new Law on Non-Commercial Organisations has been elaborated by the Ministry of Justice. Civil society has expressed concerns that this new law may be used to introduce new restrictions on NGOs, especially since civil society has not been allowed to participate in the drafting process and has not had any opportunity to influence it. In August 2017, a group of civil society organisations sent a letter to the Minister of Justice, requesting that their representatives be included in the working group tasked with drafting the law. In an interview with the Tajik service of Radio Free Europe/Radio Liberty (RFE/RL), a representative of the Ministry of Justice said that the draft law had already been passed on to the government but promised that civil society representatives would be invited for consultations and participation in the drafting should the proposal be sent back to the Ministry. Amendments to the Law on the Fight against Corruption that entered into force in June 2017 require anti-corruption authorities to assess the corruption risks in the activities of NGOs. A government working group has been set up to elaborate the procedure and methodology for doing so, but civil society representatives have not been invited to participate in this working group. NGOs fear that the new provisions may be used to unduly interfere in their activities. In the last few months, Tajikistan’s NGO Coalition against Torture has been implementing a campaign to raise awareness about the work of human rights defenders. As part of this campaign, the Coalition has published several dozen portraits of human rights defenders on its website and social media. The campaign continues until Human Rights Day on 10th December. Amendments to the Law on the Practice of Traditions, Celebrations and Rituals adopted in August 2017 introduced new restrictions on weddings, funerals and other “traditional” ceremonies. The stated purpose of this change was to prevent “extravagant” ceremonies that put strain on family budgets and to ensure that ceremonies are conducted in accordance with national custom. Among others, the new provisions place limitations on the number of guests, the food served and the time of gatherings. Weddings and other ceremonies may now last at the most three hours. The new provisions also require that national culture, including the state language and national dress, be “respected” during gatherings. Both the organisers of gatherings and the owners of restaurants and other establishments where events are held are responsible for ensuring compliance with the requirements of the law. Regular citizens may be fined up to 25,000 somoni (2,400 EUR) and judicial bodies fined 35,000 somoni (3,500 EUR) for violations, and in the case of aggravated or repeated violations, these fines may increase to 40,000 and 50,000 somoni (3,800 and 4,800 EUR), respectively. Government officials who do not comply with the law may be dismissed from their jobs. In a follow-up to the new legislation, the State Committee for Religious Affairs, together with the Council of Ulema, the country’s highest Islamic body and the Islamic Centre, gave detailed guidelines on the conduct of funeral ceremonies. These guidelines include provisions that prohibit expressions such as loud wailing, pulling one’s hair, sprinkling one’s head with soil, and scratching one’s face, as well as hiring professional wailers during funerals. They also set out that funeral participants should wear blue clothes, while prohibiting the use of black clothes as being incompatible with national custom. There have been reports of cases in which family gatherings have been raided on the basis of the new regulations. For example, in a case covered by RFE/RL, a group of local officials raided the house of a family preparing for the wedding of their eldest daughter in southern Tajikistan and confiscated most of the food they had prepared for the celebration. According to the officials, the family had prepared a “wasteful” amount of food, such as flatbreads and halva, in violation of the legislation adopted in August. However, no fines were handed out in this case. As reported before, lawyer Buzurgmehr Yorov was imprisoned after working on politically-sensitive cases. In October 2016, he was sentenced to 23 years in prison on extremism and other charges, and later he was given another five years of prison time on various questionable charges following closed trials. In September 2017, his family raised the alarm over claims that he is being subjected to torture and ill-treatment in the detention centre where he is currently held. During a visit to her son in detention for the first time in months, on 27th September 2017 he told his mother that he and other detainees had been regularly beaten, as well as threatened, insulted and humiliated by detention centre officials. Yorov also told his mother that he had been hospitalised for several days because of injuries sustained due to abuse and that he had been placed in solitary confinement several times for alleged violations of the rules of the detention centre. On 4th October, the Tajik service of RFE/RL reported that the head of the detention centre had confirmed that Yorov had again been placed in solitary confinement because of an alleged violation. Yorov’s family told the media outlet that they believed that this measure was taken in retaliation against the lawyer after they had drawn attention to the allegations of torture and ill-treatment against him and his fellow detainees. Amnesty International launched an urgent action in support of Yorov, encouraging its readers to write to the authorities in Tajikistan to call on them to release the lawyer, quash his convictions based on unfounded and politically-motivated charges, protect him from torture and ill-treatment, and promptly investigate the allegations of such treatment. Following a 1.5-hour meeting with Yorov in the detention centre, the Deputy Ombudsman told RFE/RL on 11th October that he had found no basis for the allegations of torture and ill-treatment and that Yorov had told him that he had “deserved” to be placed in solitary confinement because he had indeed violated the rules of the centre. Following the meeting, Yorov’s family was allowed to hand over food and warm clothes to him. Serious concerns about the lawyer’s health and conditions in prison remain. At the beginning of October 2017, the head of Tajikistan’s Khovar state news agency, Saidali Siddiqgave, gave an interview to Kazakhstan’s Kazinform state news agency. In this interview, he said that while state bodies in Tajikistan primarily work with his agency, they also cooperate with non-state media and representatives of foreign media and provide them with information. He stressed that national law does not grant state media any privileges in relation to non-state media. In practice, however, such privileges have been granted. In summer 2015, media reported on a government protocol signed by the president that required public agencies to send their communications and press releases directly to Khovar, while declaring that other media outlets may only report on official events by citing the state agency. This created new obstacles for non-state media to obtain first-hand access to information of public interest from authorities. In a recent development that has reinforced concerns about state interference in media activities and content, the authorities have announced steps to address the “poor” use of the Tajik language by media outlets and other resources in the country. In connection with the Day of the Tajik Language, celebrated on 4th October, government officials seriously criticised Tajik-language media outlets for what they said was a great number of grammatical and spelling mistakes on the part of these outlets. An official from the president’s office, Abdujabbor Rahmonzoda, stated in particular that some independent Tajik-language outlets “write as they please”, ignoring language norms and called for measures to tackle this problem. The State Committee on Language and Terminology also stated that its experts had found plenty of spelling mistakes in the Tajik-language version of Wikipedia and called on the resource to correct these mistakes, saying they were in violation of the Law on the State Language and a government decree on Tajik spelling. A volunteer involved in writing and editing Wikipedia’s Tajik-language content called the demand “senseless”, since Wikipedia is a free and open resource that can be edited by anyone and suggested that rather the state committee should mobilise editors to improve the content. In late August 2017, a district court in the Khatlon region found Mavlyuda Nazarova, chief editor of the local Hakikati Hovaling newspaper, guilty of “hooliganism” and fined her 30,000 somoni (3,000 EUR), a large amount in Tajikistan. The charges against Nazarova were based on a complaint filed by Guljahon Safarova, head of the Khovaling District Department for Women and Family Affairs, following a quarrel between the two women in connection with the celebration of the Day of the Family on 15th July in the local Palace of Culture. According to the journalist, she was speaking to a member of the audience, who scolded the official for making mistakes when reciting a poem on stage, when the latter approached her and asked her to refrain from publishing such criticism in the newspaper. Nazarova responded that her newspaper would decide itself what to publish. The official then got upset and attacked her. The official later claimed that the journalist had offended and hit her. Safarova said that she would appeal the ruling and that she did not have the money to pay the fine.